Many app updates focus on bug fixes, polish, tweaks, or maybe adding a smaller feature. Less frequently, a major update comes along, like an app moving from 1.0 to 2.0 or 7.0 to 8.0. For example, Instagram and Uber both saw major app updates in the past year that fundamentally altered their app experiences. Major app updates may include a brand new user experience, new visual design, or a handful of new features. There are a number of ways to recognize if your app is due for a major update. Your app doesn't need to meet all of the following criteria to require an update. Even just one consideration may justify spending the time and effort involved. Let's take a look. A simpler way to know if it's time for a major app update relates to the features of the app. If you plan to add a significant feature that notably impacts the experience of your app, you may need a major update. Some examples of significant features include authentication and syncing across devices, adding a collaborative or social element, integration with a third-party service, or changing the app's revenue model. 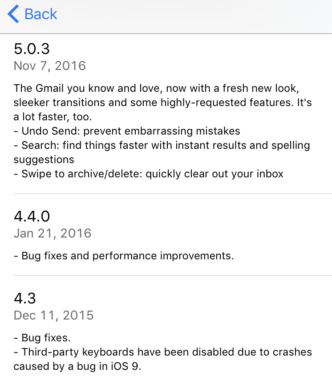 Google's release notes for the Gmail app show the difference between minor and major app updates. More generally, adding a new feature alone might just impact the minor version number, which is the second number in the sequence. Adding 3D Touch or better offline support, for example, might simply move an app from v1.2 to v1.3. So while adding a significant app feature may prompt your push towards a major update, you may also couple it with one of the other considerations that follow. If your app's design is going to completely change, whether it's the user experience or visual design, it's likely you'll need to release a major app update. A somewhat recent example of this approach is the major update rolled out to Gmail for iOS. Version 5.0 uses Material Design, changes the layout, and updates a number of functions like search. With that release, Google stopped using the "4.x" versioning. Uber also jumped from v2.x to v3.x when releasing its new design in late 2016. Overwhelmed by your app updates? Engagement is a topic we've increasingly looked at, including relevant metrics and how to drive better app engagement. Thus, it should be no surprise that not hitting your targets with app engagement or other metrics (e.g., app store ratings) is a leading factor in pursuing a major app update. If your app isn't performing as expected, it may be time for significant changes. Quantitative data may not always tell the full story. You might see that users are not coming back to your app regularly or not visiting a certain screen. What that doesn't indicate though is why that's occurring. Use the data you have to show you where you have your problems. Then augment that by talking with those who actually use your app. Comparatively, the qualitative data of your app comes in the form of app store reviews, support requests, in-app feedback, and comparable items. This feedback is absolutely vital to your success and can help identify if you should pursue a major update. There are any number of examples of user feedback that could indicate serious problems or opportunities. For example, confusion using or finding a key feature could indicate your app's navigation or the overall user experience needs considerable reworking. Similarly, if users keep asking for the same feature, that may mean you're missing a key value proposition in your app. Like in the case with your metrics, ensure you don't solely rely on user feedback. Compare it to what you are seeing in your app analytics, your market research, and what you have laid out in your app roadmap. Relying on user feedback alone may result in building costly features that add little value to your app. In app years, even a two-year-old codebase can be considered old. Four years ago, Swift didn't exist. Now Swift 3 is available. With technology changing so rapidly, an aging codebase can be a big driver to do a major update. Time alone may be deceiving because the more hands in the codebase, the faster it will age. For an app with tens, hundreds, or even thousands of developers contributing to it, there's essentially many more "man hours" in it over a compressed period of time. While all of these team members help push out app updates faster, they also make the codebase harder to manage, even with standards in place. If it's challenging to add a new feature, if there are constant regressions, or if new libraries would make a feature easier to implement, you may need to embark on a major update or even a complete rewrite. As discussed earlier, you might use a major app update to release a new design that solves problems with a feature or navigation. You may also need a major app update if the design of your app is behind the times. Not following the latest design trends could include ignoring Apple's Human Interface Guidelines or Google's Material Design. 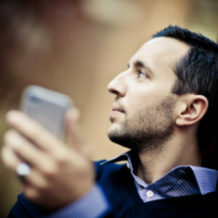 It may also simply ignore the expectation of users, such as having a fast and focused app that helps create an emotional connection with them. If your app doesn't look or function like other top apps, it won't earn a spot on user devices. A glimpse at how Today Weather's design evolved in the v2.0 major update. A major update can often be justified when your app goes across devices on the same platform or when it moves to a new platform. This could include creating a tablet-specific version or going from iOS to Android. Behind the scenes, expanding to other platforms and devices may necessitate reworking the backend service or the app's data model. It may also significantly impact the user experience and visual design. Although each design should feel native to the platform, there will need to be a cohesive experience across platforms and devices. That can result in a decent amount of changes that filter back in to the user experience and design. User experience and visual design changes can also impact the back-end servers. Releasing a major app update is your time to shine. After your v1.0 app, there are overall less opportunities to get some significant marketing traction. A major app update is one of them. Even if many users don't recognize your version number change, writers, analysts, power users, and anyone that could help you get attention for your app will. It signifies to them that you spent significant time working on something exciting. It shows you're listening to feedback, committed to your app, and continuing to invest into its future. Don't pursue a major app update just for a potential marketing push though. Use the considerations here to guide you. If and when you pursue a major app update, ensure you take the time to let everyone know about all the hard work. It will be well worth your efforts.